It is the start of the new year. This means many things for many people – new resolutions, endless plans, firm decisions. We are all caught in the rat race of perceiving the end of December and the beginning of January to be superior periods to the rest of the year; we perceive that if we can get it right in that resolution-making period, then we will be successful with the succeeding 12 months. Thankfully, we are wise enough to know that there is only partial sense in that, but we haven’t all quite figured out the actual keys to success in a new year. Many people in different corners of the world will be waking up this morning dreading the thought of resuming work, school or personal endeavours that took a break over the yuletide season; for those people, the year is already half miserable. Approaching tasks with a deflated mindset is one of the quickest drainers of success and motivation. Not many people in the world are privileged to do things which they really love, and for those people, making resolutions and drafting plans are only additions to their intrinsic motivation for success. On the other hand, millions of people drag themselves through life in the hope that they will stumble on something that ‘works for them’ – those are the ones who make endless resolutions year-in year-out with paltry success. Can it be then that everything begins and ends in the mind? Are we underestimating the power of a right mindset? Can we wake up with enthusiasm about the things which we are privileged to do, whether or not we find ultimate satisfaction with those things? Can we count ourselves favoured to be able to afford an education (any kind of education) when millions of others have no such privileges? Can we be thankful for the opportunity to work and earn incomes (regardless of quality), when the global unemployment rate seems to grow faster than most national GDPs? Can we look on our abilities, gifts, talents and skills and count ourselves among the few who are as endowed as we are? 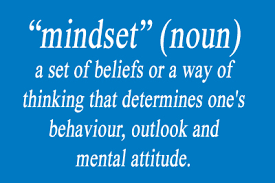 Can we change our mindsets about the things we do, and speak positively in 2015? Success is not too far from the person who sees the right things even when things aren’t right. Cultivate the right perspective – focus on the things that are, and work towards the things that can be. 2015 could be your best year yet, but much of that lies in your mindset. Let’s get to work! I wish you all that you wish yourself in this blessed year! Next Post Change? From Where?